A Barrel a Day Keeps the Scurvy Away! Amelia Island has a long history with sailors and, more specifically, pirates. While underway, the first drink to go bad was always the water. The drink that lasted the longest? Rum! Hence, rum was the preferred drink for seafaring individuals. With the current trend of microbreweries and people preferring a small batch experience, it’s no surprise that sleepy Amelia Island has its very own distillery: Marlin & Barrel Distillery. Heather and Roger Morenc opened Marlin & Barrel Distillery with a focus on high standards and delivering an exclusive, locally sourced product that locals and visitors could get excited about. The distillery itself is open for a guided tour on selects days that includes a history of the distillery, information on the distilling process and a chance to see the stills working. The rums at Marlin & Barrel are of the blackstrap molasses variety. With four different rums, 2 vodkas, 2 cellos and gin, Marlin & Barrel is sure to have a spirit that you will enjoy. Noël, an employee at Marlin & Barrel Distillery, thinks that keeping things local makes a difference. And there’s a strong emphasis on keeping the production small. Products and spirits are available for sale at the distillery for an authentic Amelia Island souvenir. Keep it local and quench your thirst at Marlin & Barrel Distillery. 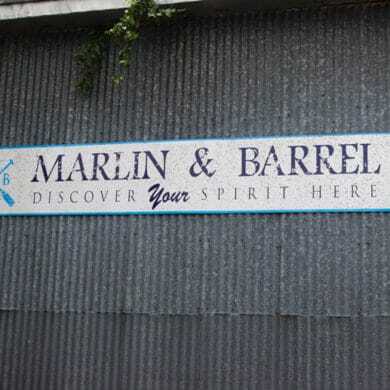 Marlin and Barrel Distillery is located at 115 S 2nd St a, Fernandina Beach, FL 32034. For more information, call (321) 230-4755.